Geoff Hunt Artist Signed Limited Edition Giclee Print:"The Fortune of War"
Size: Image size 12 x 16 inches, paper size 16.5 x 21 inches. / Canvas: 13" x 17.5"
Medium: Fine Art Giclee Print on Paper and Canvas. About the Artist: Geoff Hunt is best known for painting the covers of Patrick O'Brian novels, Geoff Hunt lives in Wimbledon, England with his wife and two sons. He was born in 1948, and studied graphic design at Kingston and Epsom Schools of Art from 1966-70, becoming a freelance artist and designer after working two years in advertising. He served as Art Editor of the journal WARSHIP from 1977-79, and has designed many books on marine subjects (including a bang-up job on Seamanship in the Age of Sail) for Conway Maritime Press. Hunt and his wife spent 1979-80 cruising to the Mediterranean and back in their boat Kipper ...a voyage described in an article in Practical Boat Owner October 1982. 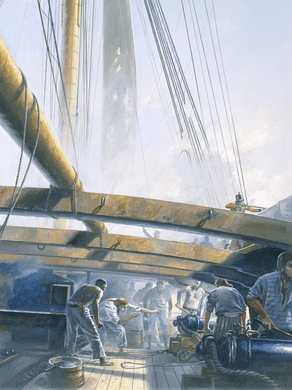 He was elected to membership in the Royal Society of Marine Artists in 1989, and has been Honorary Treasurer of that organisation for the past several years.